We know it can be difficult to find a reliable plumber in Bolton that’s both professional and trustworthy. Your satisfaction is our number 1 concern, and you only pay once the job is done, and you’re 100% satisfied with the work completed. We can help you fix or replace your central heating, including radiators and valves. We are specialists in diagnosing, repairing and replacing a wide range of boilers, including all majors brands. We’ve built up a fantastic history of satisfied clients over the last few years. 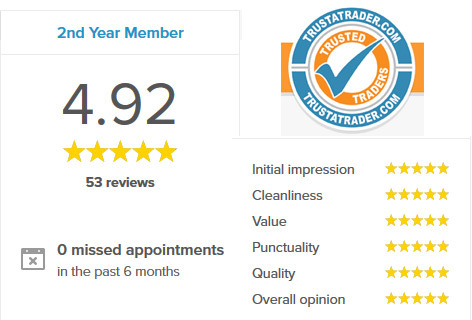 You can browse our reviews on Trust a Trader and Google. If you’ve got a mystery wet patch or a leaky pipe, have no fear, Family Choice Plumbing are here to help, with decades of experience in fixing a wide range of plumbing problems. We have a long history of serving the Bolton area, with many happy customers, and some great reviews to go with them! (see our reviews page). Get in touch with our Bolton based plumbers today! We offer same day call outs, free no obligation quotes, and we are fully insured for all work. At Family Choice Plumbing we provide a complete service, whether you are looking to install a new boiler or dishwasher, right down to a blocked drain, then look no further than us. If you need some bathroom taps, showers installed, drains cleaned, radiators changed or flushed, a water leak fixing, gas systems and certificates, then look no further than us. We are fully insured, and gas safe registered to service a wide range of boilers and central heating systems. It can be really difficult if you get a serious leak or boiler breakdown in the middle of the night, whether that’s in the week or at the weekend, and so we’ve decided to offer emergency call out, 24 hours a day 7 days a week to Bolton and the surrounding area, allowing us to get out to you asap, and get your drain unblocked, shower fixed, or boiler repairs in record time, an emergency plumber in Bolton you can rely on.